When first moving in to a new office building or home. One of the most important things to setup is your own network/Internet connection. There are multiple ways to give a device an Internet signal through wireless routers, Ethernet connections and mobile hot spots. The main thing to factor in is which connection is the most stable and fastest out of all the rest. A Ethernet connection will always be superior to any other form of internet connection. Though with a Ethernet connection it is required to have the necessary CAT 5E outlets to support the connection. That is where HPCS comes in, with our group of highly trained data run specialists. We can run, drop, terminate and install all the required cables to provide a Ethernet connection to your network for all commercial and residential properties. One of the most important questions any client ever has is, “Why not just have everyone connect through the wireless we have?” The main reason you should always prefer a LAN line to a wireless signal is the speed alone which will always be greater then the comparable wireless signal. Another point to understand is the inconsistency of using wireless Ethernet. With periods of packet loss and a straight drop in signal. Lastly, wireless signals lead to security vulnerabilities while giving access to your entire network through something as simple as a password. Trying to run an office environment off of a wireless signal is hardly applicable in today’s society and should be corrected as early as possible. As stated above, the difference between a hard wired and wireless connection is already going to be faster it terms of upload and download speed. This is also true for the bandwidth of your entire network when comparing hard wired connections to a wireless signal. Bandwidth in a literal definition is the transmission capacity of a computer signal or network, or the amount of processes your network can process at a given time. Now if you potentially have very few devices on a network the bandwidth loss can be very minimal, but when you are running a large scale network with countless amounts of devices. A hardwired connection is strongly recommended to provide quick and efficient process transfers. As great as the idea of having ether net wherever you go in your home or office. Not all devices have the feature to connect through a wireless signal and a LAN line connection is REQUIRED to have the device be functional. Take VoIP phone systems, with most of today’s society switching over to the new VoIP (Voice over Internet Protocol) phone systems. There is no ability to have these devices connect through a wireless signal. 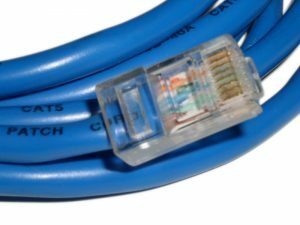 A Cat 5E cable is required to provide Ethernet and sometimes even power (this varies between brands and devices with VoIP phones). Other devices could include industrial grade Laser Jet Printers, these strictly require a LAN line connection to provide access to other computers on your network to allow printing and maintenance. Sometimes running new cables and wiring is not required in some situations. At times residential and office phone lines (original RJ11 2-4 wired connections) were ran with CAT 5E cables and when they terminated the outlets and devices they only used 2-4 wires to establish the connection between the receiver and host. Now if the situation arises to need a switch over from phone lines to Ethernet lines. 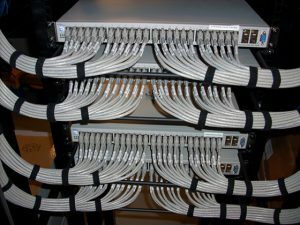 It could be a simple as simply re terminating the already run CAT 5 wires to provide it with a RJ-45 connection or 8 wired connection between receiver and host. This will provide a client with a quicker and cheaper outcome if the actual wires have already been run. Strictly pertaining to residential buildings 99% of the time. Having a home wired for LAN line Ethernet connections greatly improves the value and resale value of the home or residence. With all Ethernet connection being switched over to a broadband connection and dial-up completely being removed. Having the wiring setup in a home is not common place yet and adds value from being able to connect all rooms/offices in a residential setting with a LAN line connection. HPCS does not strictly deal with just Ethernet wiring. Our team of specialists also provide data run services for security cameras as well. Just like the discussion of wireless and LAN line Ethernet connection this pertains to security cameras as well with the advances in technology trying to provide the choice of connecting wireless security cameras to a DVR. This option is even worse then the Ethernet connection from a wireless router. Wireless security cameras have a very small range and terrible reception (tend to fall off a lot and shut off). When trying to stream HD quality video this is hardly an option compared to the hard line connection from a video cable. Seeing the vast amount of benefits that you receive from an actual LAN line connection. Being it the faster speeds, more reliable connection, allowing all devices the ability to receive a Ethernet signal. There should be no choice in the matter to when you are setting up an office or upgrading your residential property. Give a call over to HPCS to setup a free consultation and plan your installation today!